1- Like anyone who has ever walked through the valley of the shadow of divorce, Felipe and I had each learned firsthand this distressing truth: that every intimacy carries, secreted somewhere below its initial lovely surfaces, the evercoiled makings of complete catastrophe. We had also learned that marriage is an estate that is very much easier to enter than it is to exit. Unfenced by law, the unmarried lover can quit a bad relationship at any time. 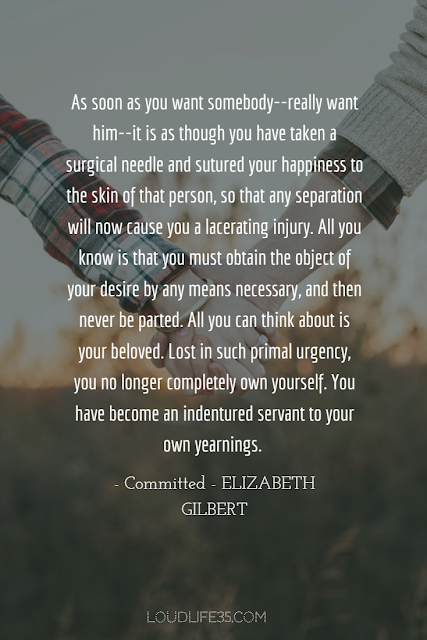 But you--the legally married person who wants to escape doomed love--may soon discover that a significant portion of your marriage contract belongs to the State, and that it sometimes takes a very long while for the State to grant you your leave. Thus, you can feasibly find yourself trapped for months or even years in a loveless legal bond that has come to feel rather like a burning building. A burning building in which you, my friend, are handcuffed to a radiator somewhere down in the basement, unable to wrench yourself free, while the smoke billows forth and the rafters are collapsing . .
2- In the modern industrialized Western world, where I come from, the person whom you choose to marry is perhaps the single most vivid representation of your own personality. Your spouse becomes the most gleaming possible mirror through which your emotional individualism is reflected back to the world. There is no choice more intensely personal, after all, than whom you choose to marry; that choice tells us, to a large extent, who you are. So if you ask any typical modern Western woman how she met her husband, when she met her husband, and why she fell in love with her husband, you can be plenty sure that you will be told a complete, complex, and deeply personal narrative which that woman has not only spun carefully around the entire experience, but which she has memorized, internalized, and scrutinized for clues as to her own selfhood. Moreover, she will more than likely share this story with you quite openly--even if you are a perfect stranger. In fact, I have found over the years that the question "How did you meet your husband?" is one of the best conversational icebreakers ever invented. In my experience, it doesn't even matter whether that woman's marriage has been happy or a disaster: It will still be relayed to you as a vitally important story about her emotional being--perhaps even the most vitally important story about her emotional being. Whoever that modern Western woman is, I can promise you that her story will concern two people--herself and her spouse--who, like characters in a novel or movie, are presumed to have been on some kind of personal life's journeys before meeting each other, and whose journeys then intersected at a fateful moment. (For instance: "I was living in San Francisco that summer, and I had no intention of staying much longer--until I met Jim at that party.") The story will probably have drama and suspense ("He thought I was dating the guy I was there with, but that was just my gay friend Larry!"). The story will have doubts ("He wasn't really my type; I normally go for guys who are more intellectual"). Critically, the story will end either with salvation ("Now I can't imagine my life without him! "), or--if things have turned sour--with recriminating second-guesses ("Why didn't I admit to myself right away that he was an alcoholic and a liar?"). 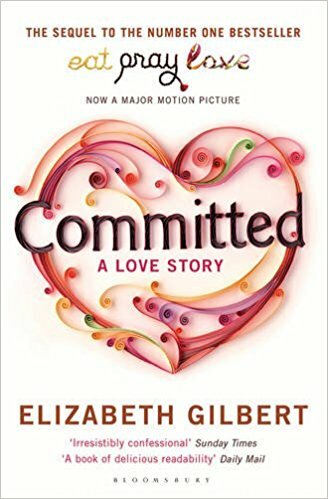 Whatever the details, you can be certain that the modern Western woman's love story will have been examined by her from every possible angle, and that, over the years, her narrative will have been either hammered into a golden epic myth or embalmed into a bitter cautionary tale. 3- Believe me, modern Western marriage has much to recommend it over traditional Hmong marriage (starting with its kidnapping-free spirit), and I will say it again: I would not trade lives with those women. They will never know my range of freedom; they will never have my education; they will never have my health and prosperity; they will never be allowed to explore so many aspects of their own natures. But there is one critical gift that a traditional Hmong bride almost always receives on her wedding day which all too often eludes the modern Western bride, and that is the gift of certainty. When you have only one path set before you, you can generally feel confident that it was the correct path to have taken. And a bride whose expectations for happiness are kept necessarily low to begin with is more protected, perhaps, from the risk of devastating disappointments down the road. 4- We Americans often say that marriage is "hard work." I'm not sure the Hmong would understand this notion. Life is hard work, of course, and work is very hard work--I'm quite certain they would agree with those statements--but how does marriage become hard work? Here's how: Marriage becomes hard work once you have poured the entirety of your life's expectations for happiness into the hands of one mere person. Keeping that going is hard work. A recent survey of young American women found that what women are seeking these days in a husband--more than anything else--is a man who will "inspire" them, which is, by any measure, a tall order. As a point of comparison, young women of the same age, surveyed back in the 1920s, were more likely to choose a partner based on qualities such as "decency," or "honesty," or his ability to provide for a family. But that's not enough anymore. Now we want to be inspired by our spouses! Daily! 5- you cannot stop the flood of desire as it moves through the world, inappropriate though it may sometimes be. It is the prerogative of all humans to make ludicrous choices, to fall in love with the most unlikely of partners, and to set themselves up for the most predictable of calamities. 6- As soon as you want somebody--really want him--it is as though you have taken a surgical needle and sutured your happiness to the skin of that person, so that any separation will now cause you a lacerating injury. All you know is that you must obtain the object of your desire by any means necessary, and then never be parted. All you can think about is your beloved. Lost in such primal urgency, you no longer completely own yourself. You have become an indentured servant to your own yearnings. 7- The problem with infatuation, of course, is that it's a mirage, a trick of the eye--indeed, a trick of the endocrine system. Infatuation is not quite the same thing as love; it's more like love's shady second cousin who's always borrowing money and can't hold down a job. When you become infatuated with somebody, you're not really looking at that person; you're just captivated by your own reflection, intoxicated by a dream of completion that you have projected on a virtual stranger. We tend, in such a state, to decide all sorts of spectacular things about our lovers that may or may not be true. We perceive something almost divine in our beloved, even if our friends and family might not get it. One man's Venus is another man's bimbo, after all, and somebody else might easily consider your personal Adonis to be a flat-out boring little loser. 8- To get anywhere close to unraveling this subject--women and marriage--we have to start with the cold, ugly fact that marriage does not benefit women as much as it benefits men. I did not invent this fact, and I don't like saying it, but it's a sad truth, backed up by study after study. By contrast, marriage as an institution has always been terrifically beneficial for men. If you are a man, say the actuarial charts, the smartest decision you can possibly make for yourself--assuming that you would like to lead a long, happy, healthy, prosperous existence--is to get married. Married men perform dazzlingly better in life than single men. Married men live longer than single men; married men accumulate more wealth than single men; married men excel at their careers above single men; married men are far less likely to die a violent death than single men; married men report themselves to be much happier than single men; and married men suffer less from alcoholism, drug addiction, and depression than do single men. "A system could not well have been devised more studiously hostile to human happiness than marriage," wrote Percy Bysshe Shelley in 1813, but he was dead wrong, or at least with regard to male human happiness. There doesn't seem to be anything, statistically speaking, that a man does not gain by getting married. Dishearteningly, the reverse is not true. Modern married women do not fare better in life than their single counterparts. Married women in America do not live longer than single women; married women do not accumulate as much wealth as single women (you take a 7 percent pay cut, on average, just for getting hitched); married women do not thrive in their careers to the extent single women do; married women are significantly less healthy than single women; married women are more likely to suffer from depression than single women; and married women are more likely to die a violent death than single women-usually at the hands of a husband, which raises the grim reality that, statistically speaking, the most dangerous person in the average woman's life is her own man. All this adds up to what puzzled sociologists call the "Marriage Benefit Imbalance"--a tidy name for an almost freakishly doleful conclusion: that women generally lose in the exchange of marriage vows, while men win big. Now before we all lie down under our desks and weep--which is what this conclusion makes me want to do--I must assure everyone that the situation is getting better. As the years go by and more women become autonomous, the Marriage Benefit Imbalance diminishes, and there are some factors that can narrow this inequity considerably. The more education a married woman has, the more money she earns, the later in life she marries, the fewer children she bears, and the more help her husband offers with household chores, the better her quality of life in marriage will be. If there was ever a good moment in Western history, then, for a woman to become a wife, this would probably be it. If you are advising your daughter on her future, and you want her to be a happy adult someday, then you might want to encourage her to finish her schooling, delay marriage for as long as possible, earn her own living, limit the number of children she has, and find a man who doesn't mind cleaning the bathtub. Then your daughter may have a chance at leading a life that is nearly as healthy and wealthy and happy as her future husband's life will be. Because even though the gap has narrowed, the Marriage Benefit Imbalance persists. Given that this is the case, we must pause here for a moment to consider the mystifying question of why--when marriage has been shown again and again to be disproportionately disadvantageous to them--so many women still long for it so deeply. You could argue that maybe women just haven't read the statistics, but I don't think the question is that simple. There's something else going on here about women and marriage--something deeper, something more emotional, something that a mere public service campaign (DO NOT GET MARRIED UNTIL YOU ARE AT LEAST THIRTY YEARS OLD AND ECONOMICALLY SOLVENT!!!) is unlikely to change or to shape. 9- First comes love, then comes marriage, then comes baby in the baby carriage? Even the very word "matrimony" comes to us from the Latin word for mother. We don't call marriage "patrimony." Matrimony carries an intrinsic assumption of motherhood, as though it is the babies themselves who make the marriage. Actually, often it is the babies themselves who make the marriage: Not only have many couples throughout history been forced into marriage thanks to an unplanned pregnancy, but sometimes couples waited until a successful pregnancy occurred before sealing the deal with matrimony in order to ensure that fertility would not later be a problem. How else could you find out whether your prospective bride or groom was a productive breeder except by giving the engine a test run? This was often the case in early American colonial society, in which--as the historian Nancy Cott has discovered--many small communities considered pregnancy to be a stigma-free, socially accepted signal that it was now time for a young couple to tie the knot. But with modernity and the easy availability of birth control, the whole issue of procreation has become more nuanced and tricky. Now the equation is no longer "babies beget matrimony," or even necessarily "matrimony begets babies"; instead, these days it all comes down to three critical questions: when, how, and whether. Should you and your spouse happen to disagree on any of these questions, married life can become extremely complicated, because often our feelings about these three questions can be nonnegotiable. 10- Moreover, while the vague idea of motherhood had always seemed natural to me, the reality--as it approached--only filled me with dread and sorrow. As I got older, I discovered that nothing within me cried out for a baby. My womb did not seem to have come equipped with that famously ticking clock. Unlike so many of my friends, I did not ache with longing whenever I saw an infant. 11- The poet Jack Gilbert (no relation, sadly for me) wrote that marriage is what happens "between the memorable." 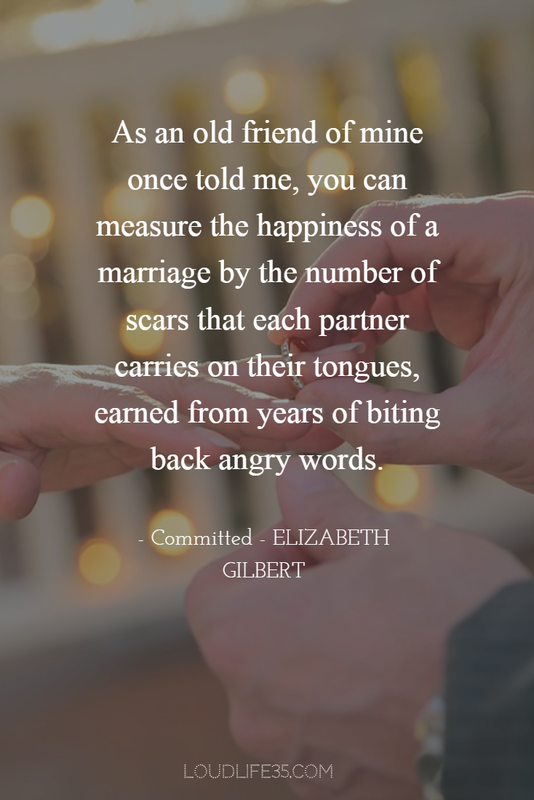 He said that we often look back on our marriages years later, perhaps after one spouse has died, and all we can recall are "the vacations, and emergencies"--the high points and low points. The rest of it blends into a blurry sort of daily sameness. But it is that very blurred sameness, the poet argues, that comprises marriage. Marriage is those two thousand indistinguishable conversations, chatted over two thousand indistinguishable breakfasts, where intimacy turns like a slow wheel. How do you measure the worth of becoming that familiar to somebody--so utterly well known and so thoroughly ever-present that you become an almost invisible necessity, like air? 12- Marriage is a harness of civilization, linking a man to a set of obligations and thereby containing his restless energies. Traditional societies have long recognized that nothing is more useless to a community than a whole bunch of single, childless young men (aside from their admittedly useful role as cannon fodder, of course). For the most part, single young men have a global reputation for squandering their money on whores and drinking and games and laziness: They contribute nothing. You need to contain such beasts, to bind them into accountability--or so the argument has always gone. You need to convince these young men to put aside their childish things and take up the mantle of adult-hood, to build homes and businesses and to cultivate an interest in their surroundings. It's an ancient truism across countless different cultures that there is no better accountability forging tool for an irresponsible young man than a good, solid wife. I have to say this, because I think it's such an important point when it comes to marriage: I do forget sometimes how much it means for certain men--for certain people--to be able to provide their loved ones with material comforts and protection at all times. I forget how dangerously reduced some men can feel when that basic ability has been stripped from them. I forget how much that matters to men, what it represents. 14- As an old friend of mine once told me, you can measure the happiness of a marriage by the number of scars that each partner carries on their tongues, earned from years of biting back angry words. 15- The Polish philosopher and sociologist Zygmunt Bauman has written exquisitely about this subject. He believes that modern couples have been sold a bill of goods when they're told that they can and should have it both ways--that we should all have equal parts intimacy and autonomy in our lives. Somehow, Bauman suggests, we have mistakenly come to believe in our culture that if only we manage our emotional lives correctly we should each be able to experience all the reassuring constancy of marriage without ever once feeling remotely confined or limited. The magic word here--the almost fetishized word here--is "balance," and just about everybody I know these days seems to be seeking that balance with a near-desperate urgency. We are all trying, as Bauman writes, to force our marriages to "empower without disempowering, enable without disabling, fulfill without burdening." But perhaps this is an unrealistic aspiration? Because love limits, almost by definition. Love narrows. The great expansion we feel in our hearts when we fall in love is matched only by the great restrictions that will necessarily follow. 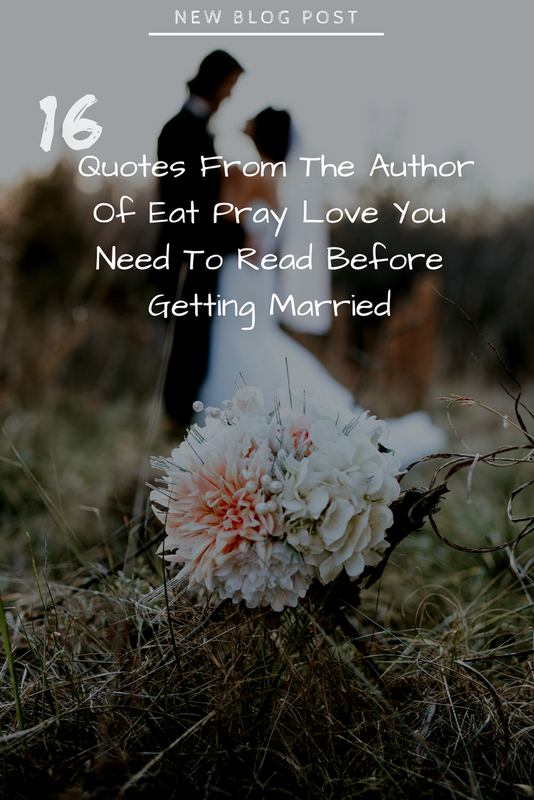 16- First spouses, I have learned, don't ever really go away--even if you aren't speaking to them anymore. They are phantoms who dwell in the corners of our new love stories, never entirely vanishing from sight, materializing in our minds whenever they please, offering up unwelcome comments or bits of painfully accurate criticism. "We know you better than you know yourselves" is what the ghosts of our ex-spouses like to remind us, and what they know about us, unfortunately, is often not pretty. Like it? Put a Pin in it!